Okay…my mind is a bit blown. It’s been quite some time since I allowed myself to indulge in fast food. Growing up in the midwest, I worked summers as a lifeguard at the city pool and remember Taco Bell being one of our favorite lunch spots. My poison, Nachos Bell Grande. Even then, I knew it wasn’t ‘good’ for me but would often make food runs and get multiple orders for the guards to scarf down between shifts. Na-cho ordinary treat! Not until last night did I get the exact same cheesy Taco Bell sensation when I attempted a modified version of Elianni’s Vegetarian Nachos recipe with their Veggie Roll/Pâté combo, using dairy-free jack cheese from Daiya and vegan sour cream from Tofutti. I made it for a party so doubled some of the ingredients. Think the trick was to dice the vegetable mixture super fine by hand, or with a Vidalia vegetable chopper. The Vegan Nachos Bell Grande didn’t last long! Will I make again? Definite YES. 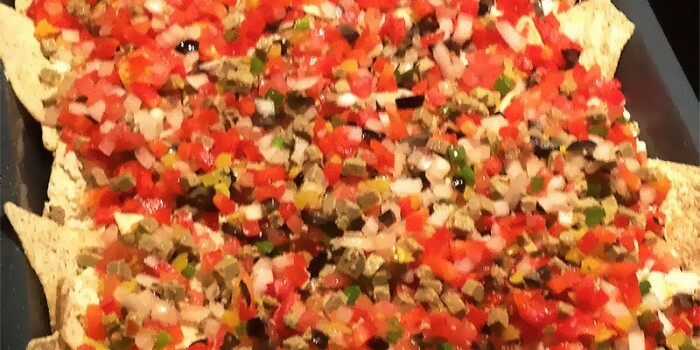 Vegetable mixture: mix Veggie Roll, banana pepper, red pepper, onion, tomatoes, and olives. 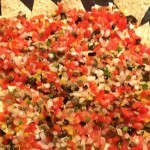 Place tortilla chips on the bottom and sides of a baking pan. Sprinkle 1/2 Daiya cheese over the chips. Bake for about 10 min. Pâté sauce: Make a blend with Pâté, vegan sour cream, garlic, oregano, and sea salt. Top with Pâté sauce, remaining cheese, and vegetable mixture. 35 y/o web guru vegan enthusiast encouraging meat/dairy-free habits. Since college, reaping health benefits of clean eating. Diet is a lifestyle, not a fad.